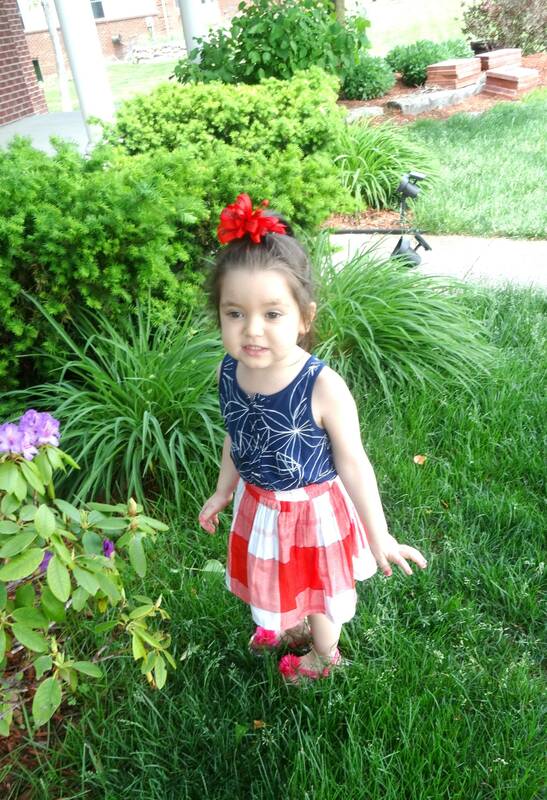 I hope your long Memorial Day Weekend was fantastic and you all got some sun and perhaps a tan, too. 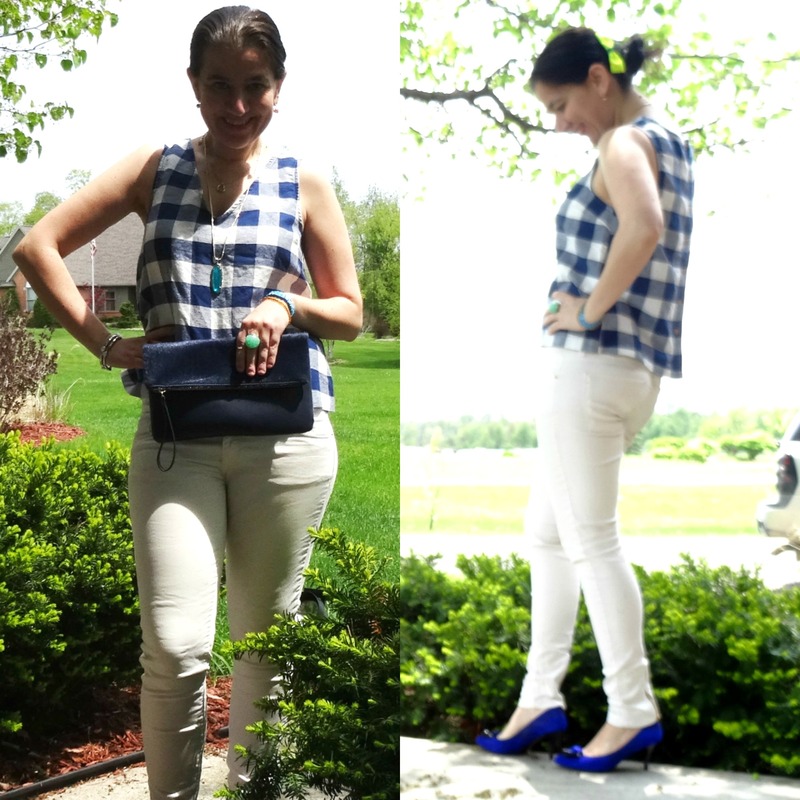 I debated whether I should post these two Gingham Outfits in two separate posts. 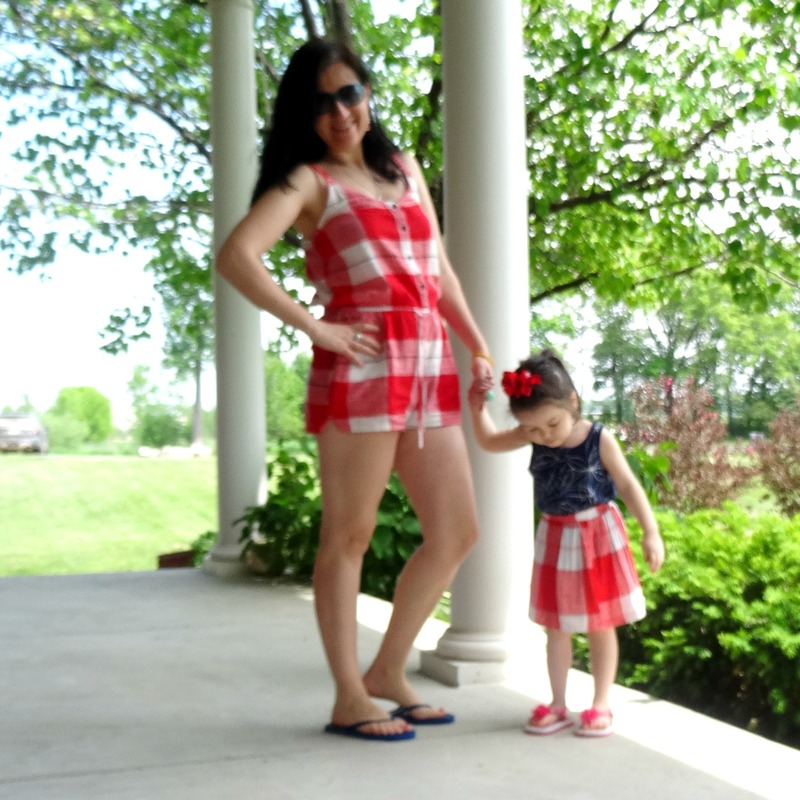 I ultimately chose to post them together because they are relevant to one-another since they show two different ways to style Gingham and wear Red, White+Navy for Memorial Day and all of our gingham pieces plus several other elements on each outfit, are from Old Navy. 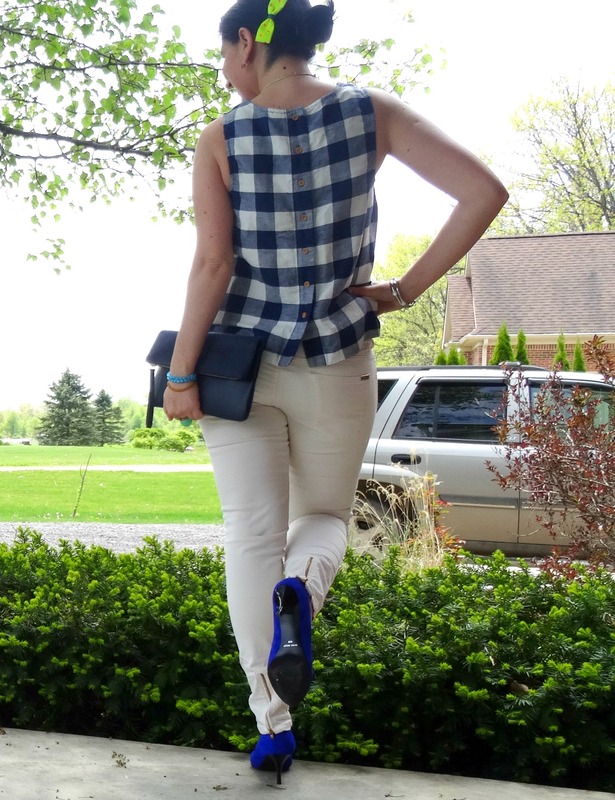 The outfit with the White Jeans and Navy+White Gingham Tank Top is a little dressier. 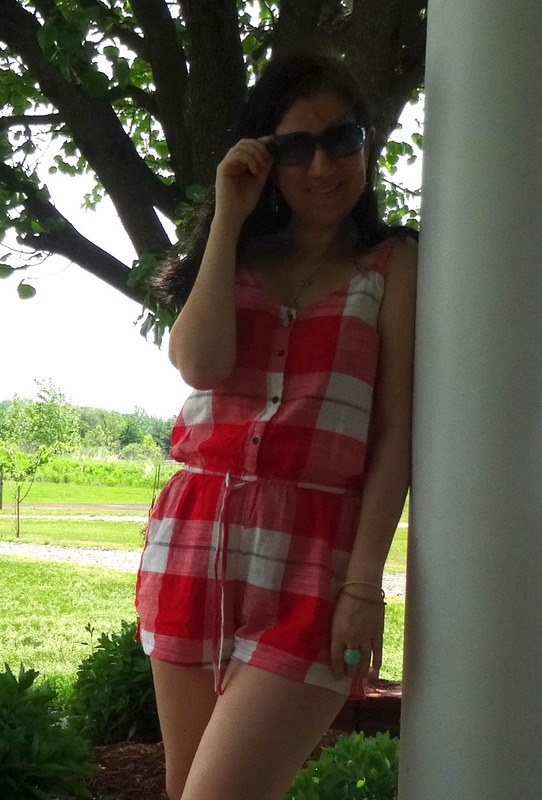 The outfit with the Red+White Gingham Romper is very casual. 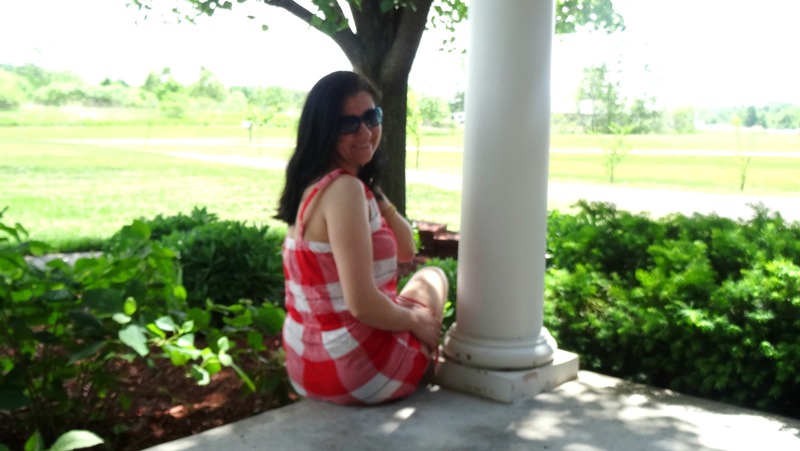 I do apologize about all the many photos today but I am so far behind with Outfits, plus I am challenging myself to wear a different dress all month of June and blog them all. 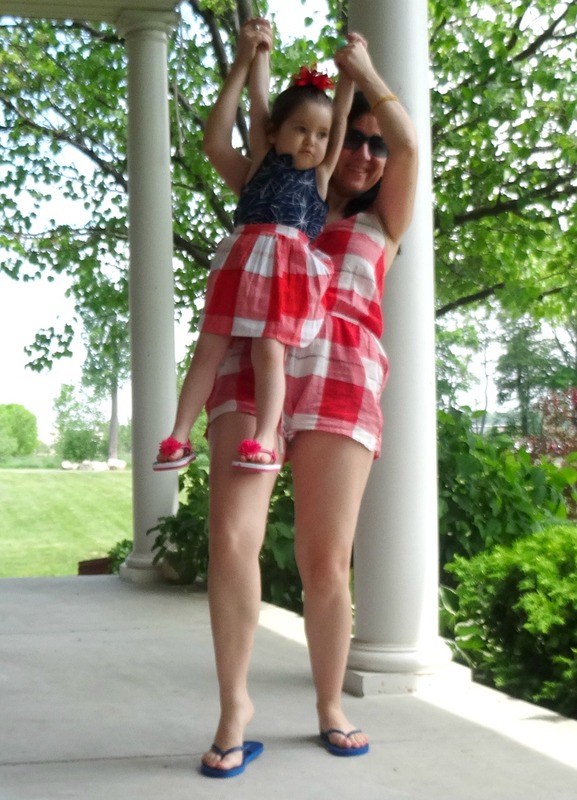 That is 30 dresses in total and I will start off a day earlier and post one tomorrow, so yeah today it's a two-fer or better yet a three-fer post, since Vivian is showing you all a third way to wear Gingham, ala toddler style. 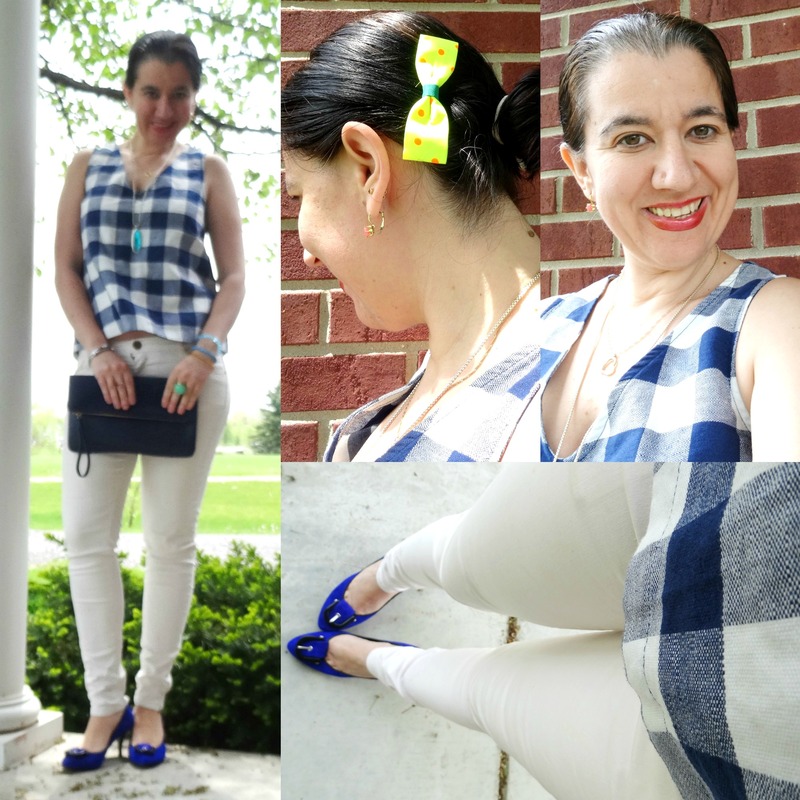 As soon as I saw this Navy+White Gingham Tank Top at Old Navy's website, I knew I wanted it. 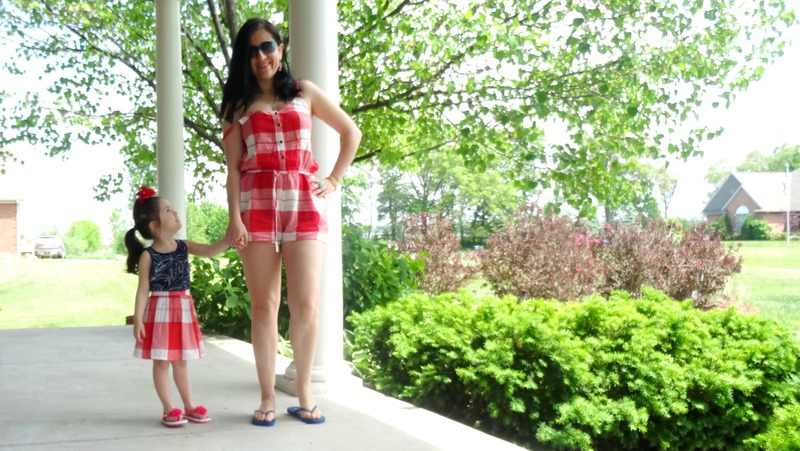 Even better that it came with matching shorts - I ordered both. The top is slightly cropped. 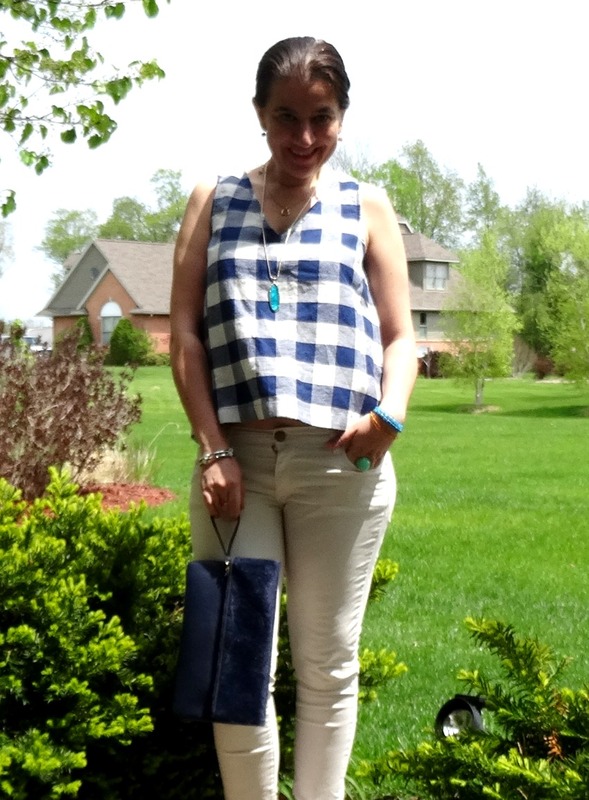 The oversized gingham and the fact that it is in white+navy make it so fresh and crisp for Summer, a little preppy and nautical too. 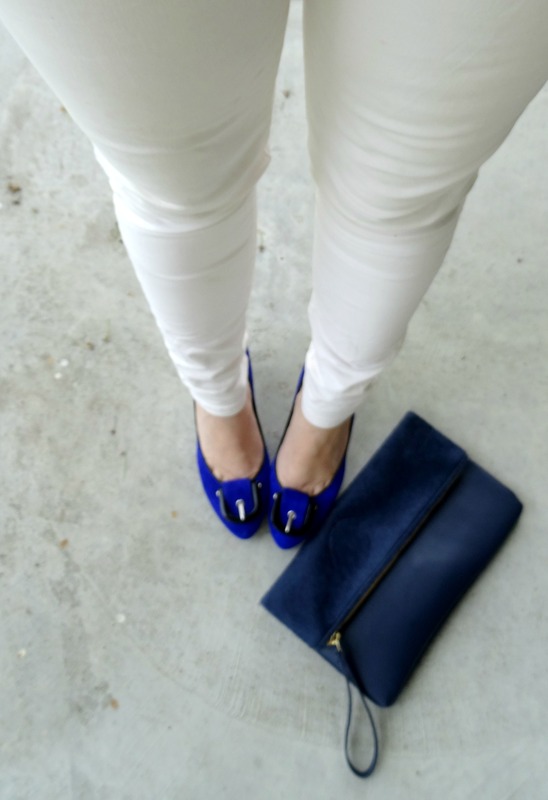 I decided to play off with the Navy and White so I wore my Zara White Skinny Jeans and a Clutch in Navy while my Kitten Heel Pumps are in Electric Blue. 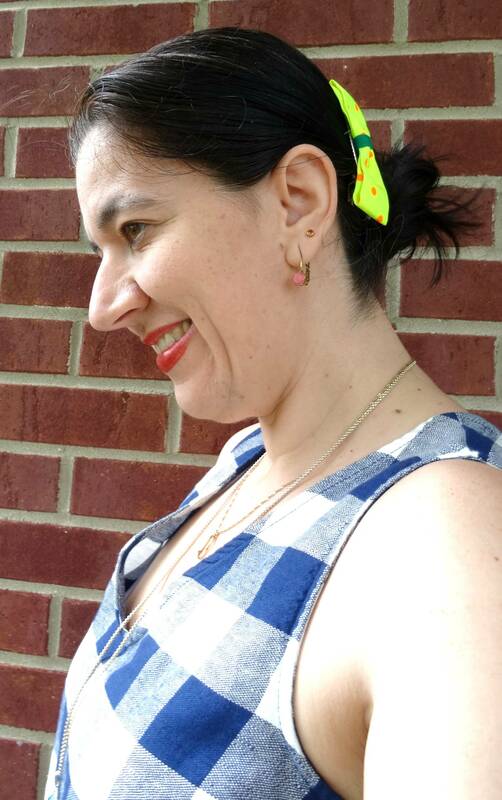 My pop of red is very subtle: lipstick and the polka dots on my Neon Yellow Bow that I added to the side of my bun. 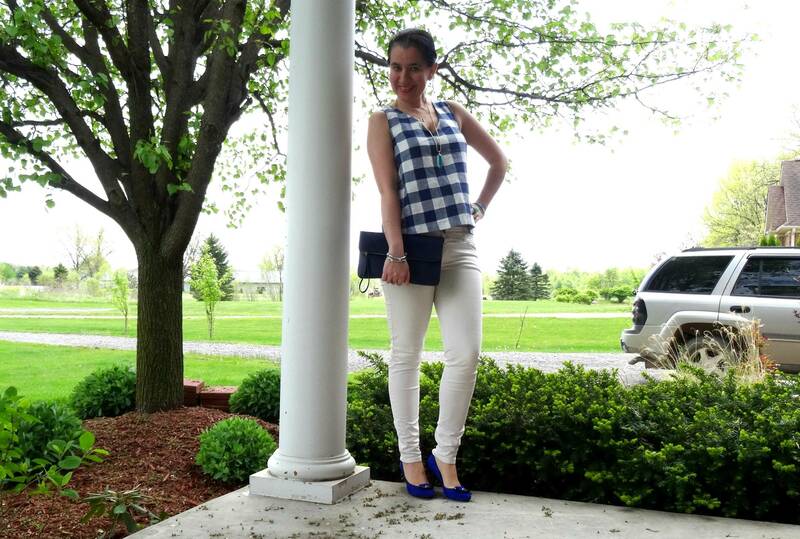 Coincidentally enough, last time I wore these pumps (3 months ago) I paired them with the same clutch and my outfit had a lot of navy, too. 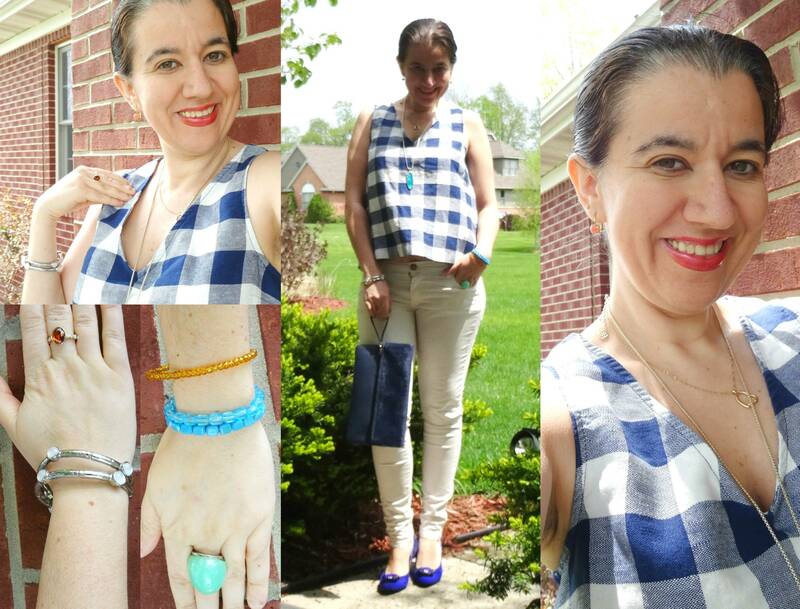 Navy+White, Cropped Button-Back, V-Neck, Gingham Tank Top: Old Navy (New) (identical, Steal), (similar, on Sale), (similar, Great Deal, love this), (similar, Splurge). White Skinny Jeans w/ back Gold Zipper on the hem: Zara (similar, Steal), (similar w/ raw hem), (similar, Splurge). 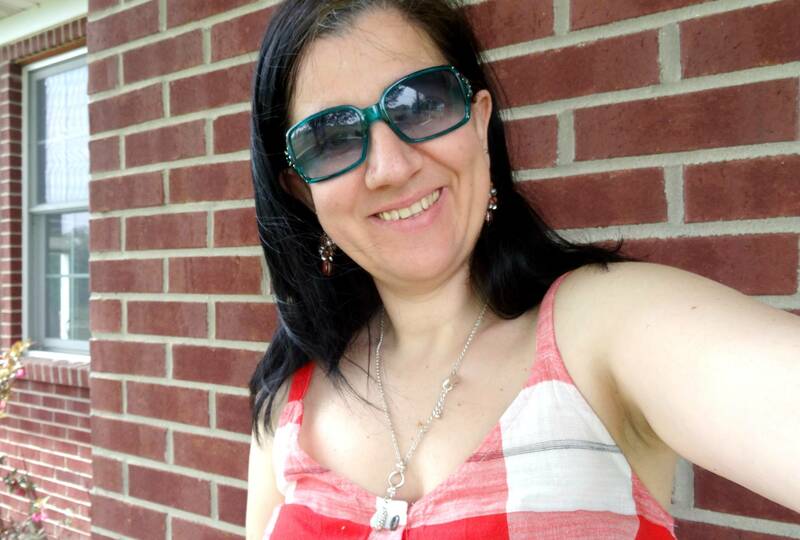 Neon Yellow Skinny Bow Barette w/ Red Polka Dots: c/o an Accessories Boutique in Albania (similar set of 3, Steal), (similar, love this), (similar, Splurge). 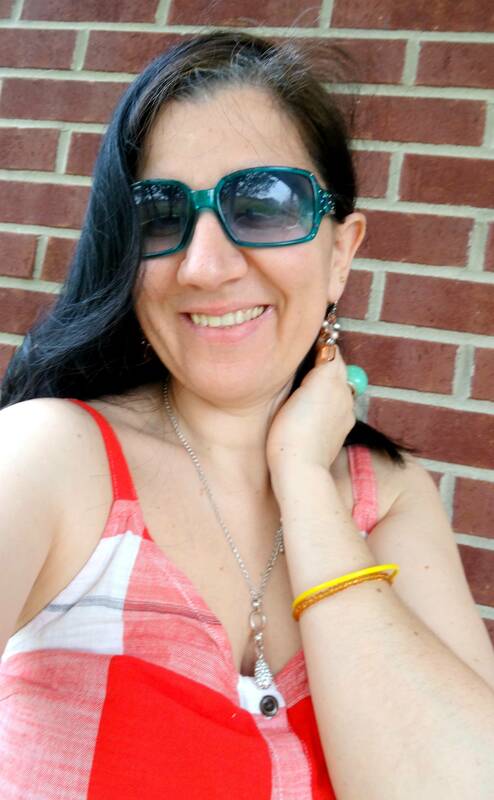 Gold-Tone Drop Earrings w/ Circle Coral Stones: a Boutique in Albania (similar, Steal), (very similar, Great Deal), (similar, small Splurge). 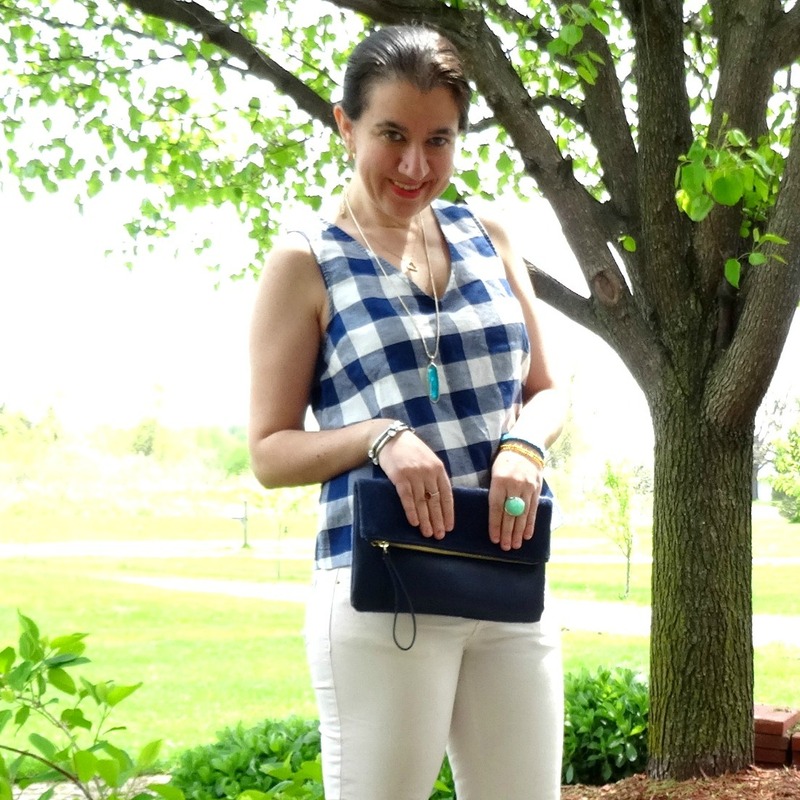 Navy Faux Leather+Faux Shearling Foldover, Envelope Clutch: Old Navy (New) (similar, Steal), (similar w/ fringe, love this), (similar, Splurge). 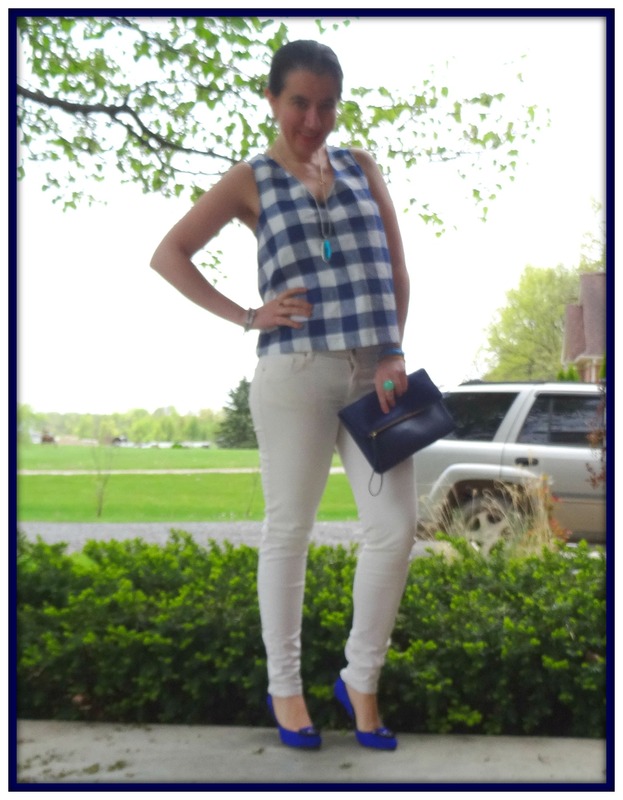 Royal Blue Suede Almond-Toe Pumps w/ Black Buckle detail: Nine West (similar, Steal), (similar), (similar, Splurge, love these). 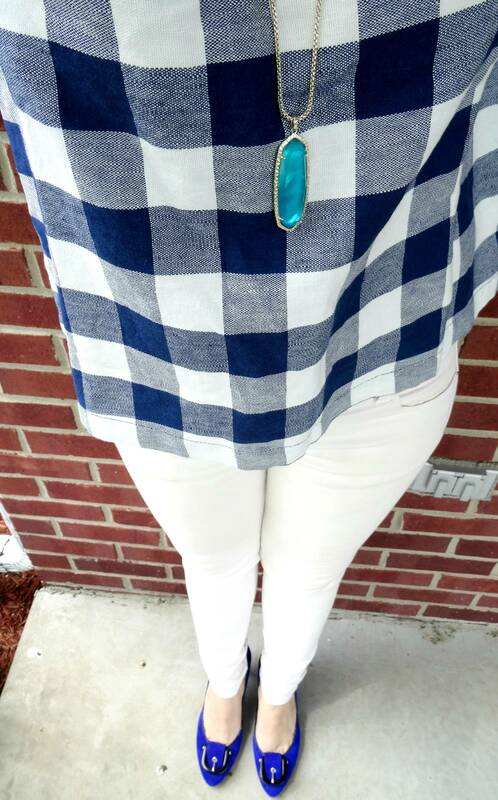 I love a little plaid skirt. 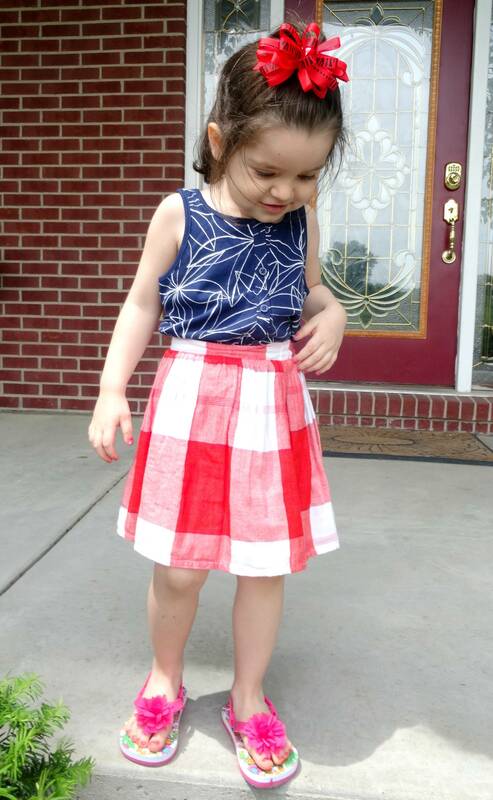 I think they evoke the classic and preppy look of a school girl so I bought Vivian's adorable plaid skirt for a steal at Old Navy. 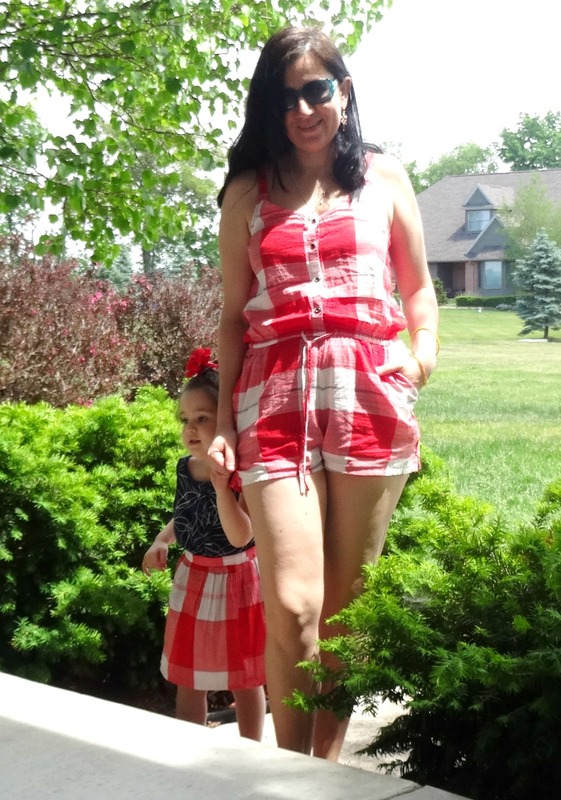 Then, literally a couple of days later I saw my romper online and ordered it. 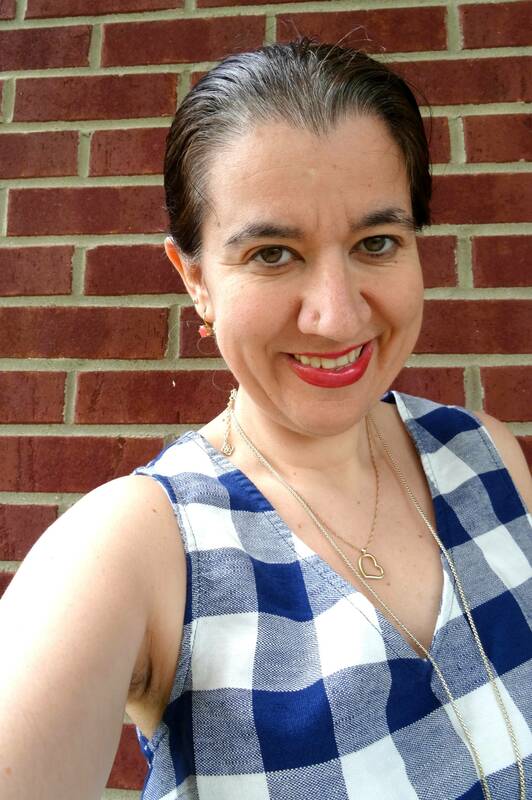 I love the large plaid pattern in an oversized gingham and the light linen material which makes both pieces great to wear all Summer long on a casual day off. 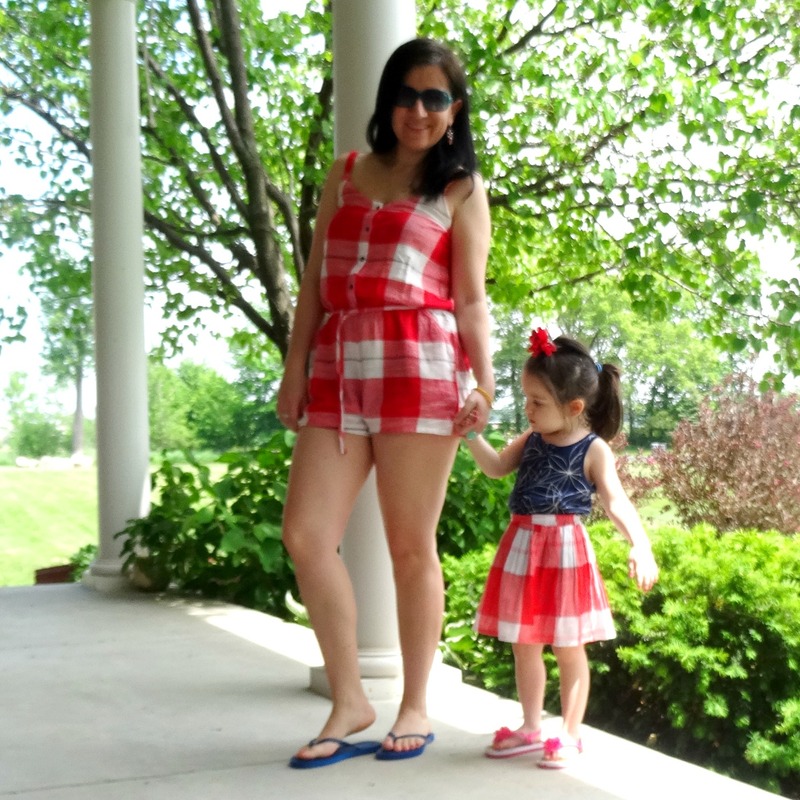 I wore my romper with Navy Flip Flops (also from Old Navy) to add the blue I was missing from my patriotic outfit and I paired Vivian's Skirt with a Navy+White Graphic Floral Tank Top (also from Old Navy). 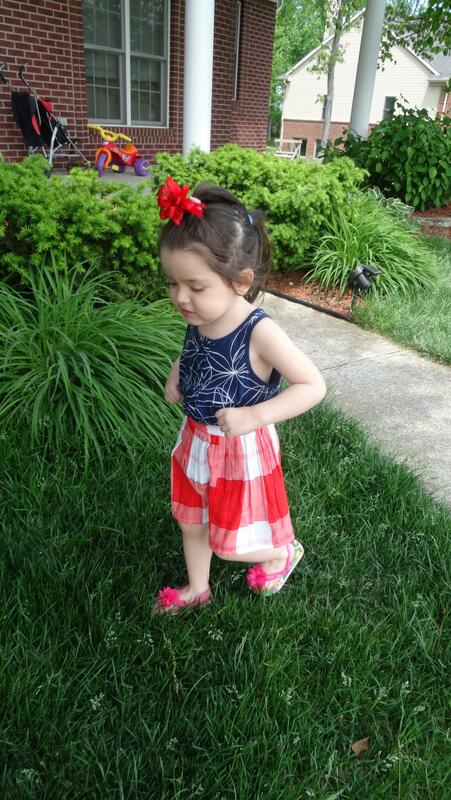 I loved how cute Vivian's outfit came out. 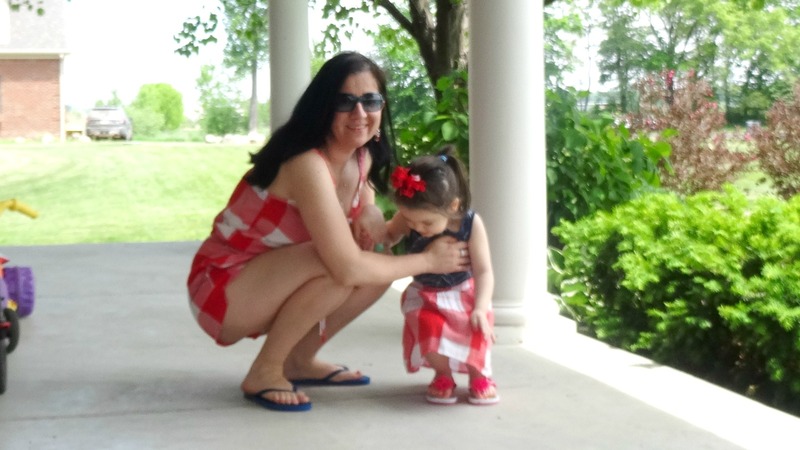 We ended up wearing these outfits yesterday (on Memorial Day Sunday) for a hot day off, of 85+ degree weather. 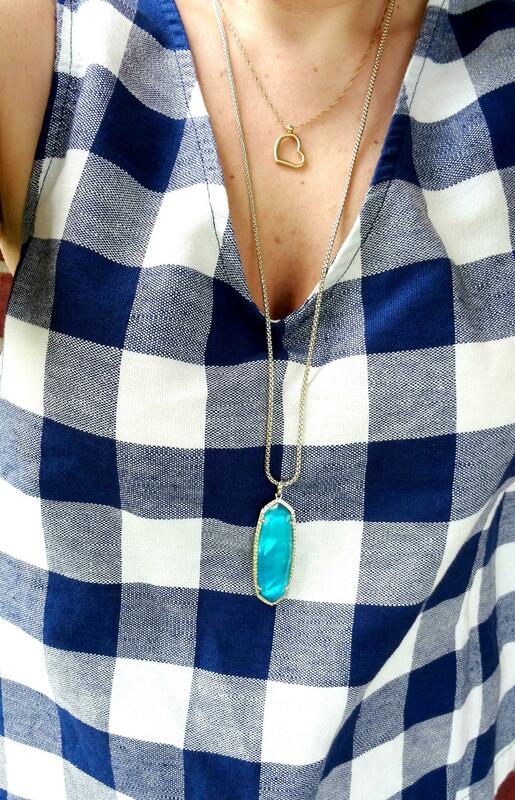 Are you wearing Gingham this Spring/Summer and how do you style yours? 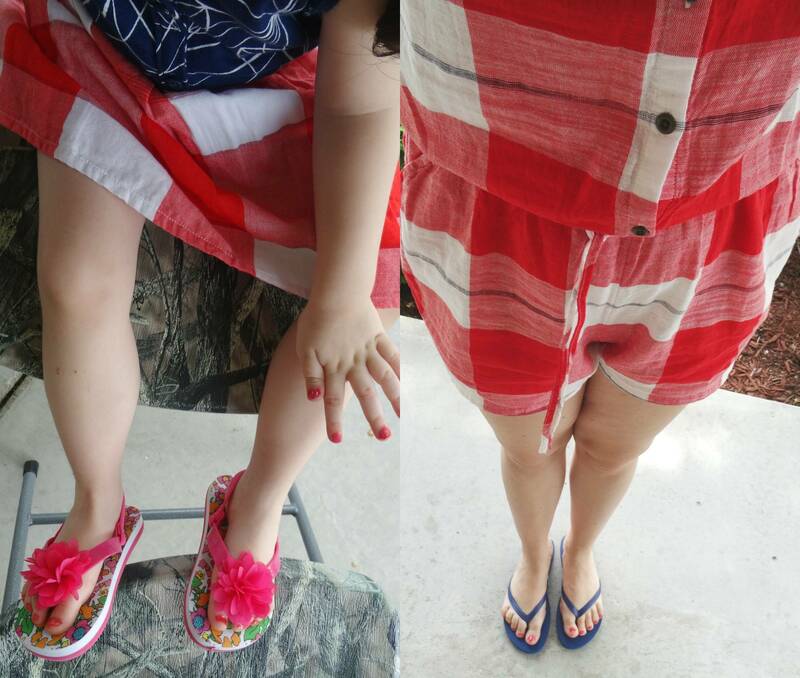 Which of my two outfits do you like better? 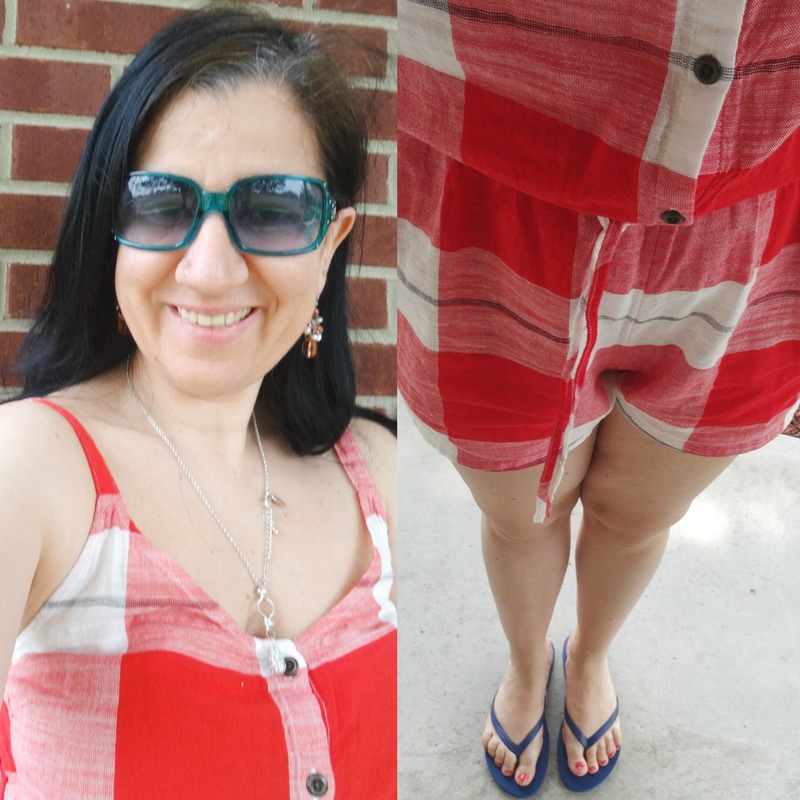 Red+White (Oversized) Gingham, Linen-Blend Cami Romper: Old Navy (New) (identical, Steal), (similar, Great Deal), (similar in oversized navy+white, love this), (similar, small Splurge). 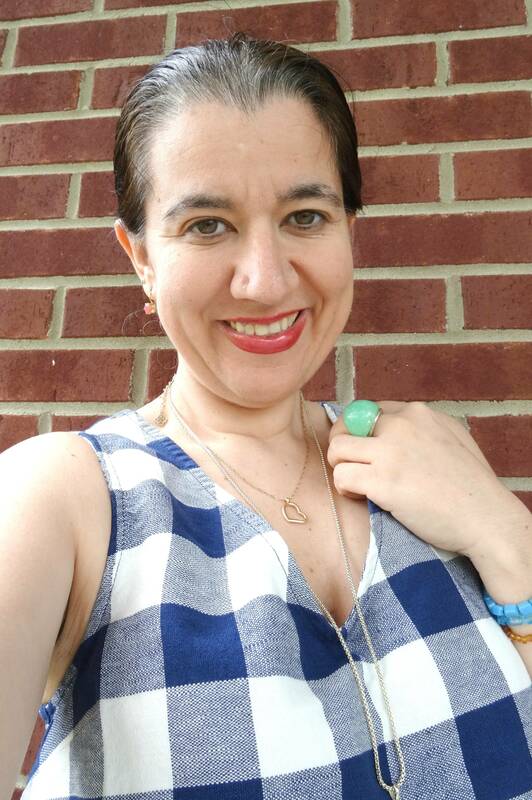 Dangly Beaded Drop Earrings w/ Soft Coral+Blush Beads: NY+Co (similar, Steal), (similar, small Splurge, love these). 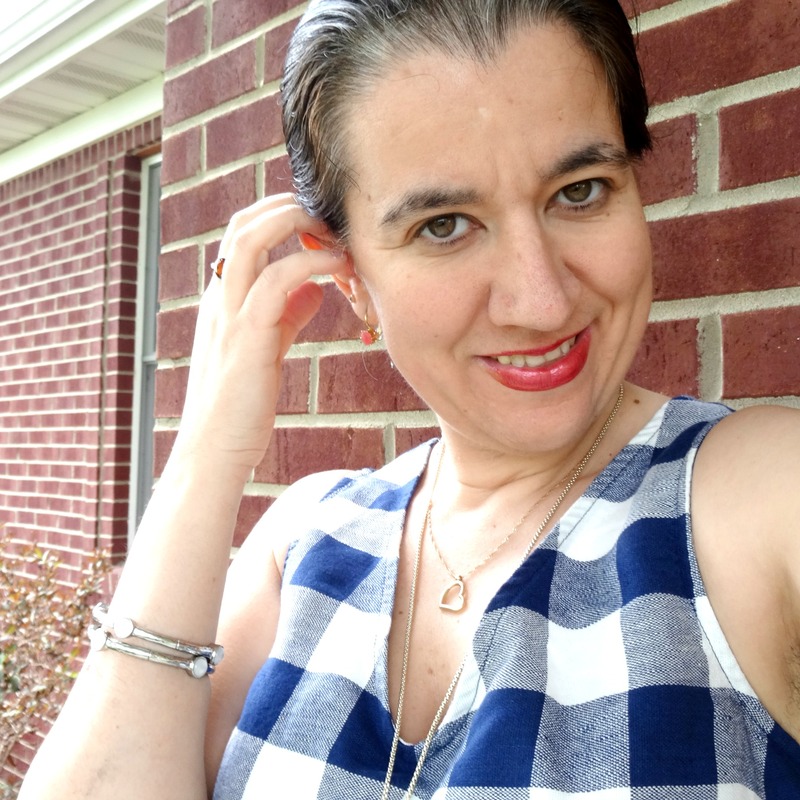 Silver-tone Chain Necklace w/ Pave Teardrop Pendant: White House Black Market (similar, Steal), (similar, Great Deal, love this), (similar, Splurge, my favorite). 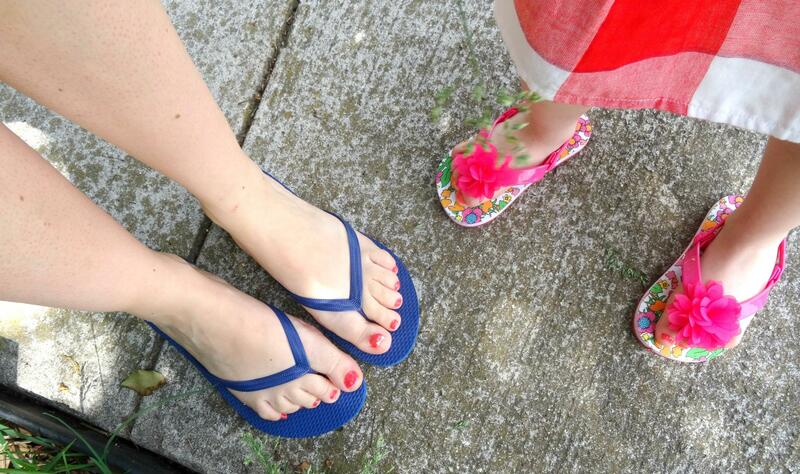 Navy Rubber Flip Flops: Old Navy (New) (same, in navy, Steal), (similar, Great Deal), (similar, small Splurge, love these). 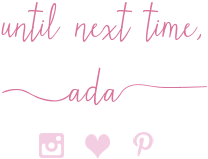 Bright Coral/Orange Nail Polish (on both of us): "Aloha" by OPI (New) (identical, love this), (similar, Splurge). 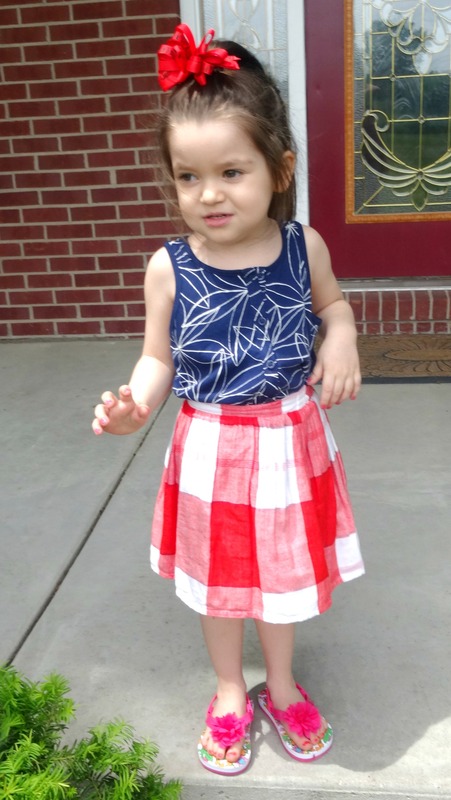 Navy, Racerback Tank Top in a White Graphic Floral Print: Old Navy (New). 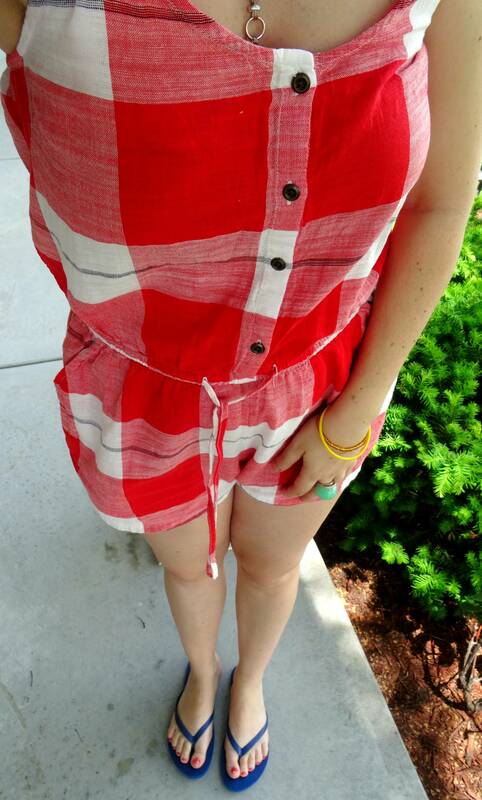 Red+White (Oversized) Gingham, Linen-Blend Skirt: Old Navy (New). 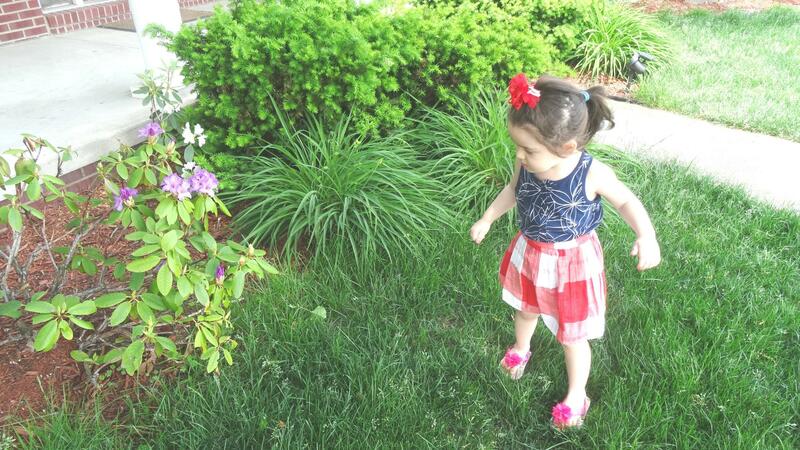 Red+Black Zebra Bow Barrette: The Dollar Store. Hot Pink Rubber Slingback Thong Sandals w/ Pink Chiffon Rosette: Circo via Target (New). 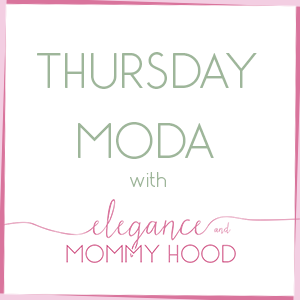 And, I am linking with Ana Luiza and Michelle for Stylish Monday. 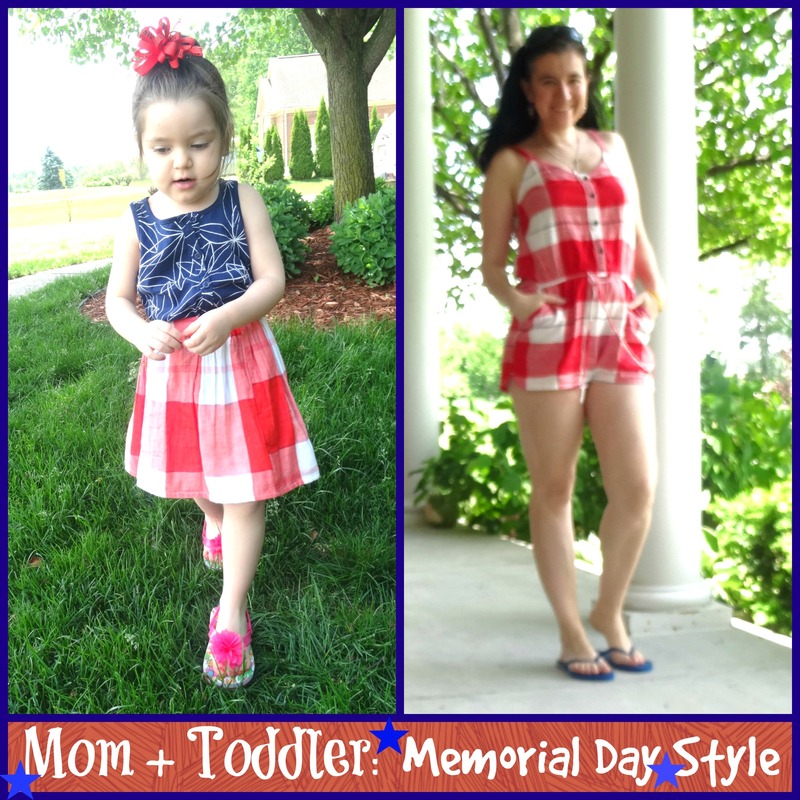 The theme this week is Memorial Day Outfit.